I met the president of Polargy, Cary Frame, today at a Server Technology event. Polargy makes cold and hot aisle containment products. Their polycarbonate and extruded aluminum panels look a bit nicer than other solutions I've come across. Polargy typically uses vinyl curtains for end of aisle containment. Polargy also represents other manufacturers' product lines such as UpSite HotLok blanking panels and PlenaForm PlenaFill blanking panels. I've used the HotLok panels for some time and they're well engineered, stack for easy storage, and snap fit for easy installation. Unfortunately they cost over $5 per 1U panel which is a little pricey to fill a rack if it's only half used. Enter Plenafill to the rescue. Plenafill panels are made of ULV94-0 flame retardant polypropylene in perforated die cut 27U size sheets. There are several types of plastic rivets for attaching the sheets to square hole, round hole, or threaded rack rails. These should work well for sealing large openings in partially filled racks. 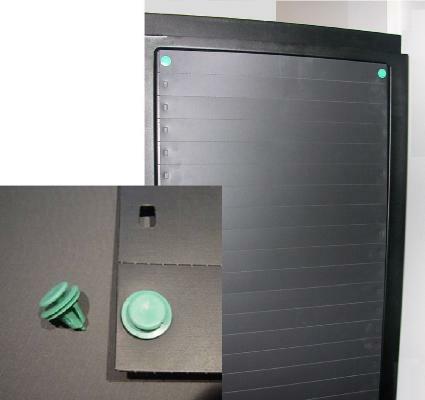 Plenafill panels are about half the cost of the UpSite HotLok panels.